Do you find that you love the process of piecing quilt tops, but do not enjoy the sandwiching and quilting process? Perhaps you have spent hours piecing a special quilt and want to have it beautifully quilted for a gift, only to find out that you have run out of time!Let us turn your beautifully crafted creation into a masterpiece to be passed down through the generations…May Gene offers personalized attention to enhance your quilt by offering edge-to-edge pantograph quilting on a Gammill quilting machine. (Pantograph quilting involves stitching a continuous-line pattern running the length of the quilt that interlocks to form an all-over pattern). A custom quilting service is also offered. Pantograph quilting starts from 19c per square inch and includes a selection of patterns and quality threads from Signature, YLI and A&E. A selection of high quality imported battings is available for the discerning quilter (eg. 100% cotton, 80/20 cotton blend, Thermore) as well as locally manufactured Loomtex. 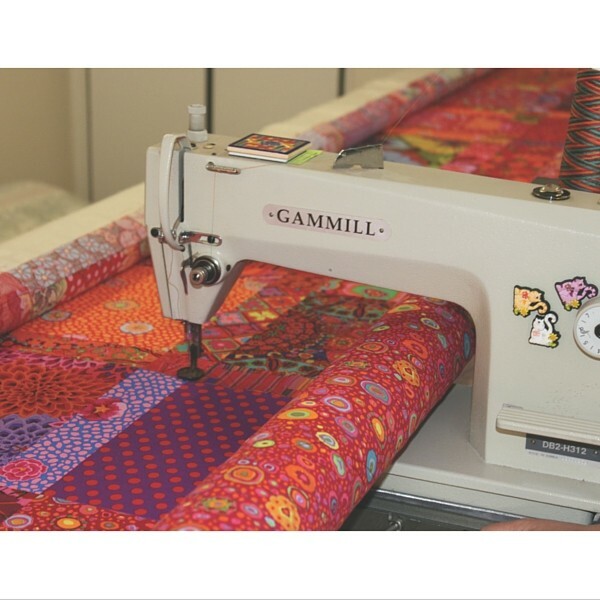 Custom quilting will depend on the density and complexity of the quilting required and can be discussed with the custom quilter.It is advisable to book for quilting in advance. Quilting services are by appointment only as it is important to spend time on a quilt consultation prior to quilting. Factors such as the quilter’s preferences, the style and pattern of the quilt and the quilt recipient’s personality will all be taken into account when choosing patterns and thread colours. If your booking is successfully submitted, May-Gene will contact you within 48 hours to discuss your quilting requirements.